Jonathan and I used to be broke backpackers, we were more than happy to be traveling the world with our backpacks, empty pockets, hopeful hearts, and massive dreams. We were dreaming of visiting every country in the world and nobody could stop us. We dreamt about it day and night, we worked hard for it, and now we finally earned it. We haven’t stepped on every country yet, but I just stepped on my 95th country and 7th continent, it’s not bad at all! Anyway, fast forward, things worked well for us, we are now earning through our blog. If you’re curious how we were able to do it, click here to know how we make money by blogging and traveling. So now, we’re not as broke as we used to be. From backpacker hostels, we can now stay in a 5-star hotel. From an economy class ticket, we can now fly in business class! From our worn out backpacks, we are now carrying stylish luggages! Now that we were given the opportunity to travel high class and frequently, we have to do it in style, especially when it comes to our luggage and travel accessories. We move a lot, so we needed one which could withstand all the airport transfers, the heat, the cold and the rain. We need it to be stylish and sleek too! Our luggage of choice: Thule, it is a stylish Swedish brand which has launched a luggage collection, the ‘Subterra’. It is designed for ABC1 consumers living active lives who share a passion for the outdoors. Stylish, versatile and built to last, the Thule Subterra collection offers luggage, backpacks, laptop bags and sleeves that help you put together a great look for your travels. I personally own Thule’s Luggage, Backpack, and Laptop Bag. And I must say, they are true to their legacy since 1942! Every time I check in my baggage on a long flight, I always feel strange fearing that I will receive it with a missing wheel or a broken handle or zipper. But ever since I switched to Thule, it never again crossed my mind. I am certain that my luggage can withstand the rigorous airport transfers and crazy weather. It is stylish- Thule checked luggage bags are not only great-looking. They are high-quality, versatile and protective. It looks luxurious but not too formal, perfect for a young traveler like me. It is built smart- Thule is built with innovative storage and carrying features. I can travel for months with my backpack and everything I have just fits perfectly. I can also organize them with a breeze due to their unique carrying features. It is strong- It is certainly built to last. 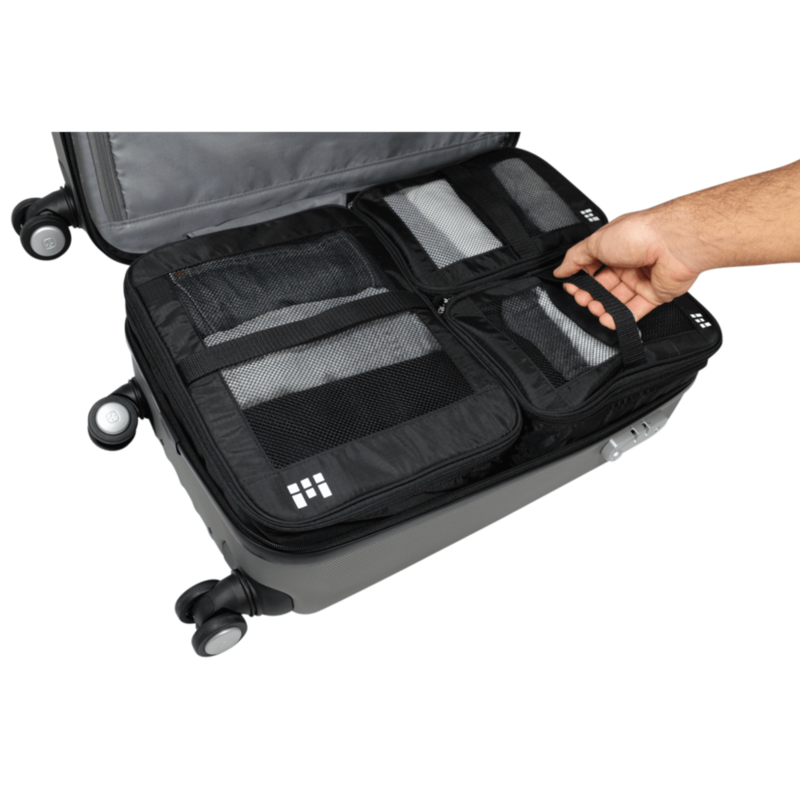 Their checked bags are designed and tested to endure the rigours of travel. Their finished bags are put to the test and made sure that they can withstand the bumps, scratches, wear and tear, heat and cold that everyone could encounter on a trip. So in case it breaks, which is very unlikely, it wouldn’t go straight to the trash and add up to the world’s waste. I have Zero Grid’s Toiletry Bag, Electronics Travel Organizer, Compression Packing Cubes Set (My favorite! ), Single Passport Holder, Family Passport Holder and Microfiber Towel Set (quick drying, anti microbial, compact! ), and I love each and every single one of them! Packing things was never this easy! It is durable- Zero Grid has a ‘buy it for life’ standard. That’s how confident they are with the products they sell. Every item in their product catalog goes through extensive product testing and research. If it doesn’t meet their high standards, it won’t be sold to the public. They have uncompromising dedication to quality and to prove that, they have a lifetime warranty. Exclusions apply of course! It is secured- Their products are made with RFID blocking, durable zippers, carabiners, and tear-proof fabric. So our belongings are always safe! Now, I can pack more things in this little bag. Zero Grid is a game changer! Will I Recommend The Thule Subterra? Yes! It’s highly recommended! You’ll get value for your money with the Thule Subterra. I loved the impact it made on our traveling lifestyle. Now, people don’t look at me at the business class wondering if I was just lost or how in the world I was able to purchase my business class ticket. Haha! Will I Recommend Zero Grid? Absolutely!! Have you ever experienced a time when everything fits perfectly in your bag when you left for your trip and for some reason, it doesn’t anymore at the end of it so you had to leave some things behind?? It’s crazy! It happened to me a lot of times already! For travelers, packing things is hard, unpacking them is harder, putting them back in again is hardest! Haha. But really, I wish I found out about Zero Grid long before! It’s definitely a game changer. I never knew I needed it until I actually took a hold of it and noticed how organized my life in general is. What I love most about it too is that it isn’t too pricey. So you can travel comfortably without having to break the bank! Will I Recommend The Alpine Earplugs? Yes! I really think this is one of the things that’s very important for travelers. Sleep is necessary, especially for long haul flights. And with these earplugs, you can definitely get your well deserved sleep.